Size: * 4.5 lb 13 lb. 25 lb. Your dog evolved as a meat eater. The structure of his teeth, jaws and digestive system scientifically classifies him as a carnivore, evolved for a meat-based diet. That’s why we loaded ACANA Heritage Meats with Angus beef, Yorkshire pork and grass-fed lamb — all raised on local Kentucky farms and delivered fresh, in WholePrey™ ratios of meat, liver, tripe, kidney and cartilage to nourish your dog completely. 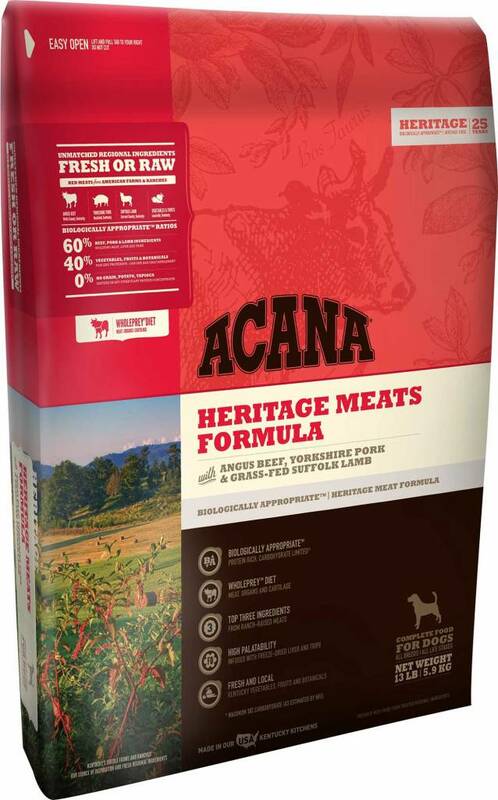 Prepared to our Biologically Appropriate™ and Fresh Regional Ingredient standards in our Kentucky DogStar® kitchens, ACANA is a natural and delicious way to keep your dog healthy, happy and strong. Deboned beef, deboned pork, beef meal, whole green peas, red lentils, pinto beans, pork meal, beef fat, chickpeas, green lentils, whole yellow peas, deboned lamb, herring oil, lentil fiber, natural pork flavor, beef tripe, beef liver, beef kidney, pork liver, pork kidney, pork cartilage, lamb tripe, lamb liver, lamb kidney, dried kelp, whole pumpkin, whole butternut squash, kale, spinach, mustard greens, collard greens, turnip greens, carrots, apples, pears, freeze-dried beef liver, freeze-dried pork liver, freeze-dried lamb liver, zinc proteinate, mixed tocopherols (preservative), chicory root, turmeric, sarsaparilla root, althea root, rose hips, juniper berries, dried lactobacillus acidophilus, dried bifidobacterium animalis fermentation product, dried lactobacillus casei fermentation product.